Gabriel Furshong is a contributor to Writers on the Range, the opinion service of High Country News. He writes from Helena, Montana. 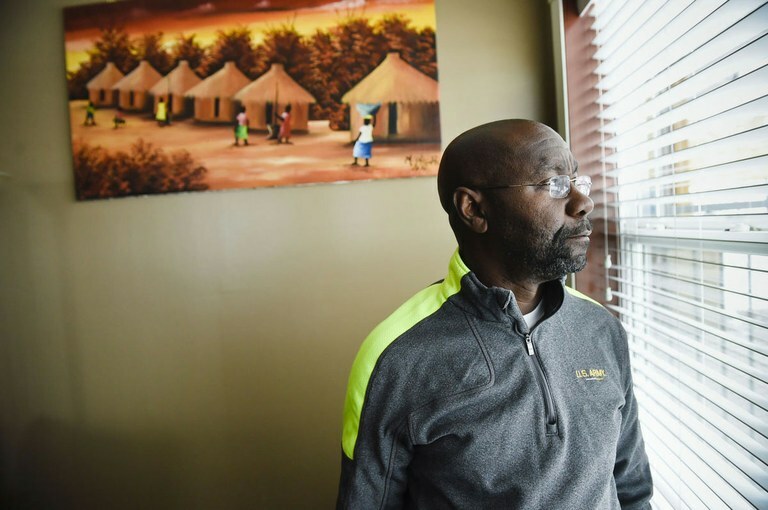 After a year of deepening political division on race and immigration, the defeat of a white, four-term incumbent by a black former refugee in Helena, Montana’s capital city, continues to draw national and international attention. In November, Wilmot Collins defeated Jim Smith by 338 votes, becoming the state’s first African-American mayor. Not long ago, a huge crowd gathered at his inaugural celebration to hear his thoughts on the unprecedented victory. But instead, they heard something else entirely. Collins surprised his audience by refusing to explain how the race was won or to speculate about what his victory might mean. He did not describe what was broken or how he would fix it. He also didn’t engage in the finger-pointing that’s become typical of so many political exchanges today. Instead, he ceded the stage to his daughter, Jaymie, and his mother, Jamesetta. Wilmot Collins, 54, in his Helena home. Jaymie, an active member of the U.S. Navy, looked down at Collins from the risers. “You’re gonna get tired,” she said, adding that resilience will be critical for the job ahead, and that in order to tolerate his critics, he better choose forbearance. Taking his cue, Collins traded places with his mother, but his speech was brief: “My mom always says, ‘God gave you two ears to listen more and talk less.’ So, I open my hands to you to say I am here to listen.” Collins then stepped out of the spotlight and joined his family. When we first moved here, my home was vandalized, ‘KKK, go back to Africa.’ You know, you can find that anywhere in America, but the reaction this community had — my neighbors got together and washed the walls down! That’s what my daughter is talking about. Initially, it got to me but, you know, there is always 5 percent you cannot change. When I went on the campaign trail, I told my constituents: ‘I will listen to you.’ It is rare (to listen) in politics today but that’s not me. These people who elected me. They are my neighbors. They are my community. My mother knows the life we lived before the (First Liberian Civil) war. We lived an upper-middle-class life, and then all of that was taken in a matter of days. All of that we lost. I lost two brothers in the war. I was homeless. My wife was homeless. But today, people want to meet with me. It says a lot about the community. It says a lot about the second chance we were begging for, and I always say I will do nothing to damage that second chance. After our conversation concluded, I sat there and thought about this unusual elected official. I replayed the advice of his mother and daughter. I revisited the opinions they had shared and considered how they shared those opinions. No doubt, Helena’s new mayor understands the need for fierce policy debates at times. But the advice of his family reminds us of another need — to voice experiences and values that unite us rather than political platforms that divide us. It is worth wondering how the toxic tenor of national political debates might change if more of us practiced forbearance and gratitude. What would happen if, in the words of Montana’s first African-American mayor, we opened our arms to one another and said, “I am here to listen”?